UPDATED September 19, 2016 – For many people, the joy and sense of personal achievement after losing weight can be quickly diminished or overshadowed with leftover excess skin, especially on the arms. Once the skin stretches beyond its natural capacity, it may become difficult to shrink back to its original size. Instead the skin will likely just hang as loose (like a hammock) or fold on certain areas of your body such as stomach,neck and upper arms. This excess skin can be attributed primarily to, pregnancies, rapid weight gain or loss and other natural growth spurts. Stretch marks also frequently appear after rapid weight fluctuations. 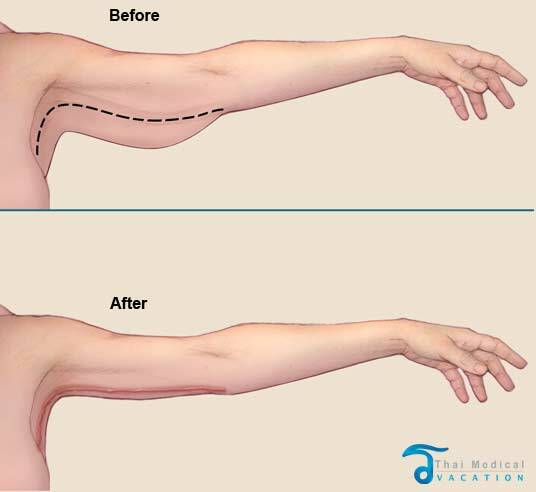 Arm lift surgery is also known as brachioplasty or arm skin reduction surgery. Arm Lifts are designed for both men and women seeking to remove this unwanted excess skin to allow nice tight, smooth skin on the arms. An Arm lift procedure can also give you a boost in self confidence without hurting your pocketbook too much in the process. Thai Medical is proud to offer affordable upper or lower arm lifts from qualified internationally accredited cosmetic surgeons in both Bangkok or Phuket. We offers several solutions including non-surgical and surgical options to help you reach your physical goals. Brachioplasty surgery is usually one of the top 5 most requested plastic surgeries in Thailand. The popularity of this treatment is mainly attributed to the extremely difficult nature of getting rid of the loose folds of skin naturally. Exercises alone usually cannot help such a conditions thus limiting your options to having Arm Reduction Surgery. A surgical Brachioplasty surgery is performed by carefully making tiny incisions on the inside or back of your arms. The micro-incisions sizes will vary based on the amount of fat removal needed. Some patients may only require minimal incisions near the upper arms and this technique is known as the minimal incision arm lift surgery. This option is ideal for patients with only a small amount of excess fat and skin that is located closer to the armpits. Patients who recently lost large quantities fat following bariatric surgery or weight loss surgery such as the Tummy Tuck may have more fat or excess skin than average and will require a traditional surgical Brachioplasty that will requires incisions. After the incisions are made, the excess skin and fat is trimmed off, tightened and sutured back into its new place with sutures. The sutures will may be dissolvable sutures or require removal 5-7 days post surgery. Can help create a proportionate figure without the excess skin or fat. Costs 50-65% less than the same treatment back home without compromising on quality. 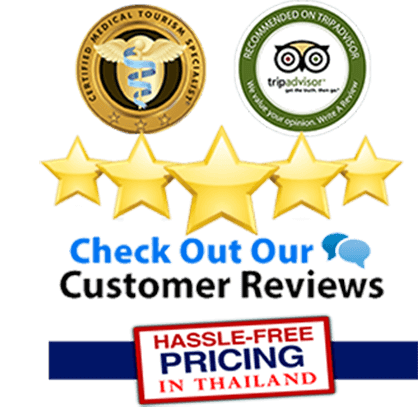 The money you save can pay for an entire 5-7 night medical holiday to Thailand including airfare and 4 or even 5 star hotel! Arm lifts are usually performed under general anesthesia but may also be done using under local anesthesia using minimally invasive liposuction such as the BodyTite RFAL, SmartLipo or VASER. The simple treatment can be done as an outpatient (no hospital required) but may require a 5- 7 night in total to allow for proper follow ups. 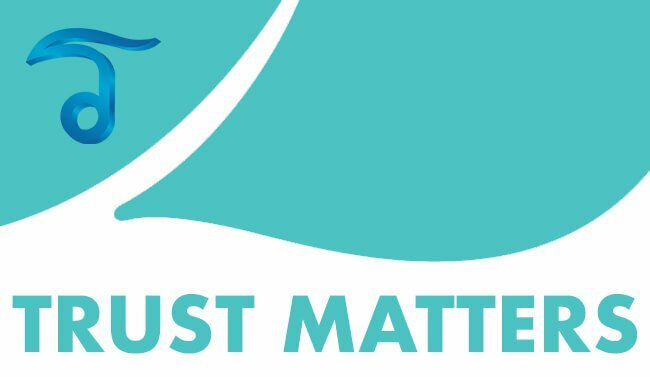 Surgical Brachioplasty are performed at an internationally accredited, modern JCI Accredited hospital. Arm lift surgeries generally only takes around two to three hours to complete. The costs of having Arm Lift Surgery in Thailand depends entirely on the scope of work needed. Non-Surgical arm lifts usually cost less than surgical armlifts and require less overall recovery time in Bangkok. 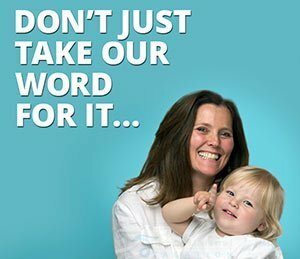 To get actual fixed prices and multi-area discounted prices our doctors will need to conduct a virtual consultation using your pictures. 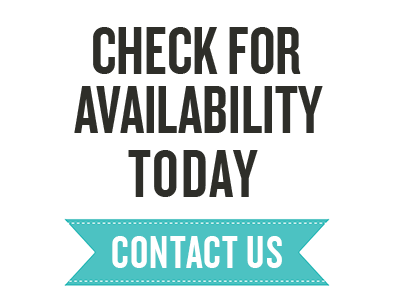 The total “no-hassle” prices we provide will include all your medical related expenses including the surgical fees,hospital fees,doctors fees and anesthesia fees and may include 1 night stay at a JCI accredited hospital in a private room with full time nurse and all meals. The total cost will not include cost of airfare or any additional hotels stay. 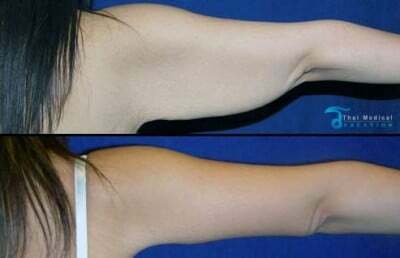 To request an evaluation for having Arm Lift or Brachioplasty in Thailand please contact us today. I need a Brachioplasty arm lift surgery with upper arm reduction and some lipo. How much?